At Callander Bay Church, our desire is to be followers of Christ or disciples who make disciples. Most of the time when we want to accomplish something in the church, we make a program to try and move people in that direction. The Way of Jesus is so much more than just a program, it is a way of living. It will have some programmatic pieces but generally it is more about relationships and letting the life of Christ flow through you. Our EMCC national team has been the crucible for the development of guiding statements that empower the follower of Jesus. 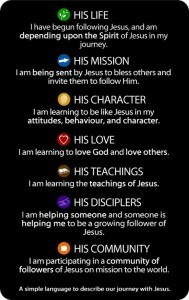 Here is the 7-fold way of Following Jesus. The seven statements are stated in the first person, ‘I’. 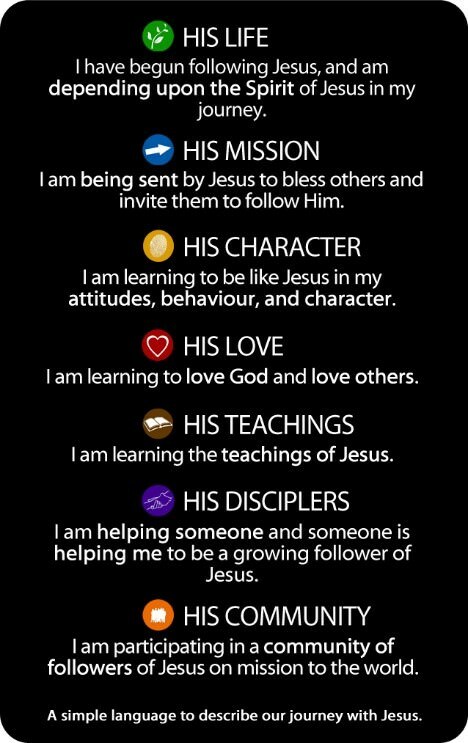 It is about ME following Jesus, Not about what somebody else tells me to do or does for me. The 7-fold Statement is about the ongoing journey. No one has arrived! And everyone can start, or restart. It is a journey. And He is still leading, and I must follow. It is the responsibility of parents to raise and teach their children, and it is the responsibility of a follower of Jesus to invite and help others to begin that journey too. As parents we appreciate the support of school and church but we must not let either supplant us as parents. As a follower of Jesus I appreciate the support of the community of Christ, the Church, but I cannot let the Church supplant my following after Jesus. And I cannot let the Church supplant my responsibility and my privilege of inviting others to begin that journey with Jesus. There is no ‘program’ that is as powerful and as attractive as Christ in me and Christ in us the hope of glory. The Kingdom (the rule) of Christ becomes tangible when we simply bless (serve) others for His sake – humbly bringing good into His world. We know that God is already at work in the lives of others and so we simply join Him ‘out there.’ Jesus is sending me to bringing blessing into the lives of others for His sake.